Sudanese Refugees in Ethiopia (file photo). June 20 is internationally commemorated as 'Refugee Day', and Ethiopia is chosen to congregate to mark the 2017 edition. Thus, the United Nations High Commission for Refugee UNHCR has finalized its programs to celebrate the date in Ethiopia. Accordingly, the UN High Commissioner for Refugees, Mr. Fillipo Grandi together with his senior officials of UNHCR will arrive in June 19 to mark the day, which will be held in the Regional State of Gambella where more than 400,000 South Sudanese Refugee are currently sheltered. Together with him, renowned musicians, internationally recognized correspondents that hail from CNN, AP, are expected to give media coverage to the event which is expected to be colorfully celebrated. The UNHCR country program is also preparing to receive its international staffs and invited guests who are scheduled to participate. Hence, local and international Medias, besides the Media corps - invited by head quarters of UNHCR in Geneva - are invited to cover the events to be held in Gambella Regional State's refugee camp. High Commissioner Grandi is also scheduled to meet Ethiopian Prime Minister Hailemariam Desalegn regarding to talk over regarding the issue of refugees, and with Addis Ababa Mayor Diriba Kuma with regards to the 8000 Square Meters land that will be allotted for the construction of UNHCR office and Ethiopian Administration for Refugee and Returnee Affairs aka ARRA. During the event, representatives from Ethiopian Foreign Affairs will make detailed speeches on the issue of sheltering refugees, the cooperation between the Ethiopian government and the UNHCR, directives on the future cooperation, and how to handle and accommodate refugees in the manner of the UN principles. The High Commissioner will also give details about the ever influx of refugees and dwindling resources to provide refugee needs. Ethiopia hosting this big event is a confirmation and recognition to the exemplary, brave and innovative approach to providing shelter the country has displayed throughout its history. And the Ethiopian Foreign Security Policy and Strategy continues to promote peace and cooperation between Ethiopian and incoming refugees. Ethiopia, historically, begun receiving refugees during the 7th century when the Ethiopian Christian King received and protected prophet Mohamed followers from Saudi Arabia. Since then, this ancient state has received refugees from African countries during the war against colonialists, their struggle for independence and the civil wars which followed in some African states later. Currently, Ethiopia hosts more than 830,000 refugees that fled their homes from 20 countries making it the leading largest refugee hosting country in Africa. Uganda also shelters equivalent number of refugees to Ethiopia nowadays. Our country, derived from its culture to shelter guests (one of which Ethiopia's best culture) houses refugees in its 25 refugee sheltering camps, and the refugees settling in the country are often overwhelmed by the welcome they receive from Ethiopian people. The UNHCR and other donor partners are also doing anything humanly possible to assist the refugees side by side with the Ethiopian government. Ethiopia has promised on nine directions to improve ways of handling refugees during the Leaders' Summit held in New York on September 20, 2016. The nine directives focus on improving the socio-economic conditions of refugees, providing quality and fast solutions to what they demand, to provide job opportunities so that they can use their skill & knowledge to live comfortably. The efforts is expected to be achieved with the cooperation of World Bank and other concerned governments of the world. Hence, Ethiopia is adapting new strategies and proclamations to incorporate the new nine directives that were agreed during the Leaders' Summit. The top five countries of origin for refugees in Ethiopia are Somalia 41%, South Sudan 35%, Eritrea 15%, Sudan 2%, Djibouti 0.4% while the rest account for 7%. In addition to this, there are close to 4000 Djiboutians in Ethiopia, constituting 26% of the all Djiboutians abroad making it the second largest destination for Djiboutians after France. 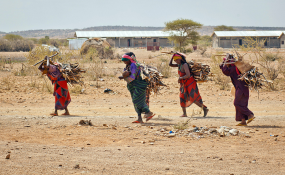 Ethiopia shelters 33% of the total number of refugees in the IGAD region and 2.3% of the total number of refugees world-wide, while producing 0.5% of the world's total number of refugees, thus caring for more than its share of the global refugee burdens. In addition to this, a total of refugees 20,000 such refugees reside in Addis Ababa comprising refugees in need of special medical attention unavailable in camps, migrants with serious protection concerns or inability to stay in camps for humanitarian reasons; and Eritrean Refugees enrolled in the Out of Camp Policy (OCP). Ethiopia prioritizes education for school-aged refugees, and as a consequence, the current 2016/17 year has seen 35,563 new students enrolled in early Childhood Care and Education, elementary and secondary schools, bringing the total number of refugees enrolled in general education in Ethiopia to 179,022 including 75, 359 female students. Thanks to the generosity of the Ethiopian people and the open door policy of the government, Ethiopia has been recognized and praised globally for its benignity to house such huge number of refugees that fled from more than 20 countries. And I hope many of the promising issues which will make refugees happier will be implemented in the near future.